Rev. Phil Bosserman, Ph.D., professor of sociology and peace studies at Salisbury University, was the founder of the Center for Conflict Resolution at Salisbury University. He began his long career of teaching, preaching and traveling in 1948 as an Emporia High School delegate to the founding conference of UNESCO. From then on, he dedicated his life to pulling people together for a common cause — peace. Bosserman’s life was a meaningful cavalcade of protests for peace and justice, sharing community-changing ideas worldwide, mentoring the multitudes and quietly living a life of love, laughter and commitment shared among his many colleagues, devoted friends and a great big family. Bosserman majored in political science and history at historic Baker University in Baldwin City, Kan., in 1952. He went on to Boston University, where he earned a master’s degree in social ethics and sacred theology. Following study at the University of Paris (Sorbonne) in 1956, Phil was awarded his Ph.D. in social ethics and sociology. While Phil served as director of young people’s activities and full-time pastor, the young clergyman clashed with church hierarchy by joining the NAACP. Bosserman courageously left the pulpit to work for civil rights and to teach. In 1962, when the Peace Corps was new, Sgt. Shriver recruited him to serve as director of education for Gabon, Equatorial West Africa, where Bosserman oversaw the building of 40 schools. A fateful accident during Gabon’s coup for independence led to Phil’s hospitalization at the Lambarene hospital compound. Dr. Albert Schweitzer’s staff saved his life and forever nurtured in Bosserman his enduring passion, optimism for the possibilities of peace. His Christian education foundation led him to greater classrooms as professor, first at Baker University then at Boston University. In 1965, Phil became director of Peace Corps training programs at Dartmouth College, N.H. When his wife, Sue, was diagnosed with MS in 1967, the family, now six, moved to the warmer weather of Tampa, Fla. Bosserman joined the faculty of the new University of South Florida, where he taught sociology and leisure studies. 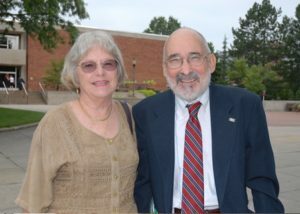 Following Sue’s death in 1971 and his remarriage to Carol Conley, Bosserman left USF in 1975 to head Salisbury University (then Salisbury State College) in the Department of Sociology and Anthropology. After nearly 20 years as department chair, Phil retired from SU in 1994 to teach at Jogakuin (Christian Women’s) University in Hiroshima, Japan. Phil was a born leader. Though a self-proclaimed “pest” who talked too much in Latin class, he got his Eagle Scout at 16, served as class president in high school and college, was vice president of student government, pledged Zeta Chi and was honored by ODK. Ever active, Bosserman wowed as a college cheerleader, presented at international conferences, won Fulbright Awards, taught peace studies in uncertain times and founded the Center for Conflict Resolution. An accomplished pianist, Phil loved good music. It resounded through the house, always, and perked him up on gloomy days when his memory failed. His children and grandchildren share his musical legacy and passion. Through his lifetime, compassionate Phil retained his license to preach. An ordained Methodist minister, he baptized, married and buried countless students, friends and family during his half century in the pulpit, as had his bearded grandfather and great-grandfather before him. A remarkably gentle man with a captivating aura not unlike Boston classmate the Rev. Dr. Martin Luther King Jr., Phil Bosserman emanated peace. His voice was soft, expressive, its cadence reassuring; his quiet step was playful. Phil’s hands danced when he described a thought to attentive students. With a quick laugh and characteristic arch of his familiar brow, Bosserman was beloved by all who knew him. Following heart surgery, strangers knew him for 20 years as the professor who walked 10 miles a day, rain or shine. He baked bread wherever he visited; he shared wine and wonder with friends the world over. A great Bosserman love was Paris and anything French. He also enjoyed sailing, tennis, riding to market on his bike (or a train anywhere), fishing, tossing horseshoes, growing vegetables, cooking for those he loved, and, later in life, the joys of grandchildren and golf.